Ghyll Bank and Ghyll Bank Cottage are two very tastefully restored cottages, full of character with oak beams and open fires in a spectacular setting looking out towards Causey Pike and up towards Catbells. These properties are in an ideal location if you want tranquility, natural surroundings, views from every window, walks in every direction from the doorstep and easy access to Keswick which is only 15 minutes drive through some stunning scenery. Free unlimited WI-FI. Ample parking. Ghyll Bank has two lounges, dining kitchen, downstairs cloaks, utility room, three bedrooms, one double with en-suite, one twin room and a third bedroom with three single beds.The cottage is finished to a very high standard and offers excellent accommodation with walks from the doorstep. This is a superb. spacious family homefrom home and has oil fired central heating, plenty of parking and private patio to the rear. Ghyll Bank is the larger of the two cottages and from the front door you enter into a traditional farmhouse hallway with doors leading to the various rooms, downstairs cloaks, utility room and the staircase with its traditional spindles, newels and handrails. There are two lounges. The main lounge has two very comfortable sofas, TV, DVD & CD players. This room is quite spacious & has the original beamed ceiling. There is a traditional slate fire suitable for open fires. The second lounge leads through to the dining kitchen and has a sofa, two easy chairs and a brand new inset log burning stove. There is also a CD player in this room. The dining kitchen which has plenty of fitted units, electric oven and inductuction hob, dishwasher, fridge & small freezer. There is also a large pine dining table & six chairs. There is a utility room with a washing machine and plenty of coat hooks and space for boots. Upstairs there are three very large bedrooms. 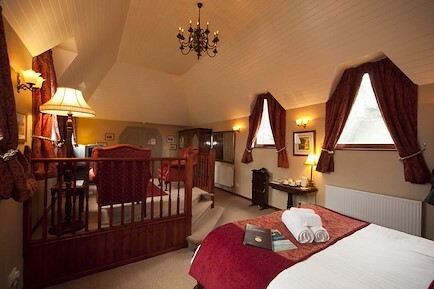 The main bedroom has a double bed with matching pine furniture and an en-suite shower room with WC & wash hand basin. There is a very large family room with three single beds. This room again has fantastic views toward the fells and is furnished in pine. At the back of the house is a large twin bedroom furnished in pine and offering excellent views.The bathroom has bath with shower over, WC, wash basin and tiled floor. Ghyll Bank Cottage has a lounge, large dining kitchen, cloaks and utility room on the ground floor. Upstairs there are three bedrooms, two double rooms and one twin room. The cottage is finished to a high standard and offers excellent accommodation with walks from the doorstep. This cottage offers superb family accommodation and has oil fired central heating, plenty of parking and private patio to the rear looking up to the fells. Ghyll Bank Cottage is the smaller of the two semi-detached cottages but with no less character or facilities. The very cosy lounge has two large, very comfortable sofas, an inset log burning stove in the original slate surround, TV, CD player etc. There are beams in this room as throughout the cottage and fabulous view toward the fells. The kitchen is very spacious with plenty of worktop space and is superbly fitted and has electric oven & hob, integrated dishwasher, integrated fridge & freezer, microwave etc. In this room there is a large pine dining table and six matching chairs. Off the kitchen there is a utility room with a washing machine, plenty of coat hooks and access the patio. On the ground floor there is also a cloakroom with WC and wash hand basin. Upstairs there are three very pretty bedrooms. The main double room is very spacious and finished with pine bed, wardrobes and units. From this room you look up towards the fells. There is a small, second double bedroom again with the most spectacular views out towards the fells. On the second floor via a twisting staircase there is a fabulous twin room full of character with its sloping ceilings and exposed beams. This room is lovely and bright. The bathroom has bath with shower over, WC wash basin and tiled floor. There is a utility room with a washing machine and plenty of hanging space. To the back of the cottage is a patio area where you can relax and just take in the scenery. Your enquiry will be sent directly to Ghyll Bank & Ghyll Bank Cottage. Please fill in as much detail as you can.